When military strategists plan a mission, one of many factors is the toll it takes on the Army's foot soldiers. A long march and heavy load drains energy. So military strategists are often concerned with the calories a soldier will burn, and the effect of metabolic stress on their overall physiological status, including body temperature, fuel needs and fatigue. 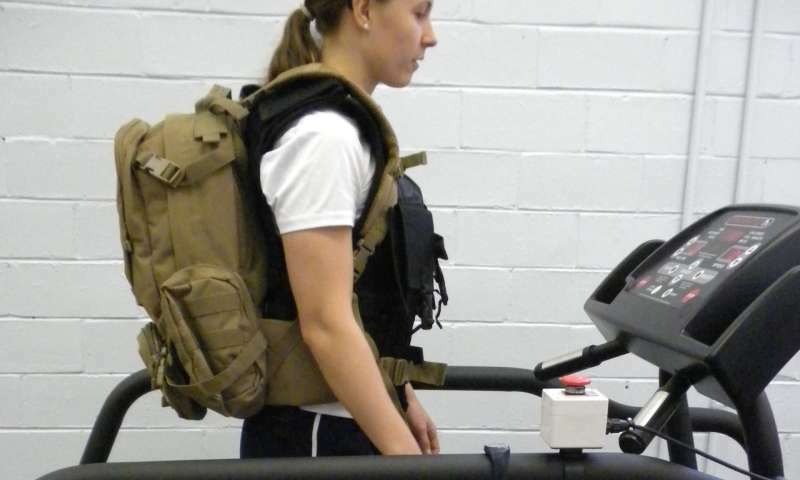 Now scientists at Southern Methodist University, Dallas, have discovered a new more accurate way to predict how much energy a soldier uses walking. The method was developed with funding from the U.S. military. It significantly improves on two existing standards currently in use, and relies on just three readily available variables. An accurate quantitative assessment tool is important because the rate at which people burn calories while walking can vary tenfold depending on how fast they walk, if they carry a load, and whether the walk is uphill, downhill or level. "Our new method improves on the accuracy of the two leading standards that have been in use for nearly 50 years," said exercise physiologist Lindsay W. Ludlow, an SMU post-doctoral fellow and lead author on the study. "Our model is fairly simple and improves predictions." The research is part of a larger load carriage initiative undertaken by the U.S. Army Medical and Materiel Command. The average load carried by light infantry foot soldiers in Afghanistan in April and May 2003 was 132 pounds, according to a U.S. Army Borden Institute report. 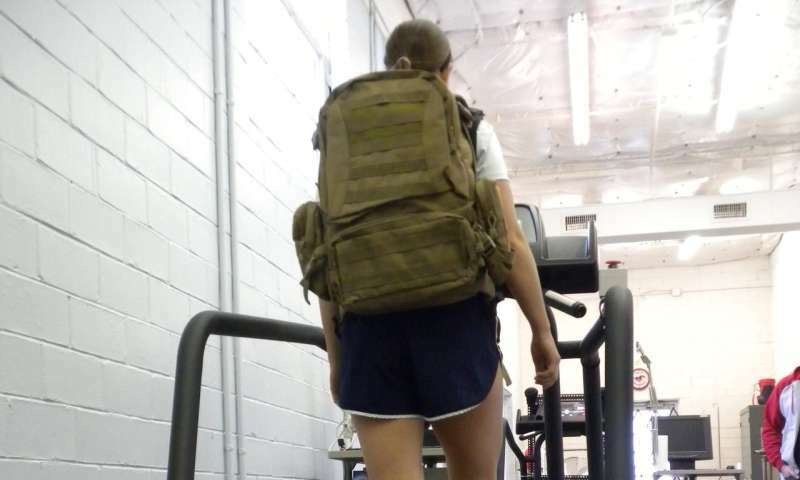 "Soldiers carry heavy loads, so quantitative information on the consequences of load is critical for many reasons, from planning a route to evaluating the likelihood of mission success," said SMU biomechanist and physiologist Peter Weyand. "The military uses a variety of approaches to model, predict and monitor foot-soldier status and performance, including having soldiers outfitted with wearable devices," Weyand said. "There is a critical need with modern foot soldiers to understand performance from the perspective of how big a load they are carrying." Weyand is senior author on the research and directs the Locomotor Performance Laboratory in the SMU Simmons School of Education, where subjects for the study were tested. The researchers call their new method the "Minimum Mechanics Model" to reflect that it requires only three basic and readily available inputs to deliver broad accurate predictions. They reported their findings in "Walking economy is predictably determined by speed, grade and gravitational load" in the Journal of Applied Physiology. The necessary variables are the walker's speed, the grade or slope of the walking surface, and the total weight of the body plus any load the walker is carrying. "That's all it takes to accurately predict how much energy a walker burns," Ludlow said. While the measurement is a critical one for foot soldiers, it's also useful for hikers, backpackers, mall-walkers and others who are calorie conscious and may rely on wearable electronic gadgets to track the calories they burn, she said. Existing standards now in use rely on the same three variables, but differently, and with less accuracy and breadth. The new theory is a departure from the prevailing view that the mechanics of walking are too complex to be both simple and accurate. "Ultimately, we found that three remarkably simple mechanical variables can provide predictive accuracy across a broad range of conditions," Ludlow said. "The accuracy achieved provides strong indirect evidence that the muscular activity determining calorie-burn rates during walking is tightly coupled to the speed, surface inclination and total weight terms in our model." By using two different sets of research subjects, the researchers independently evaluated their model's ability to accurately predict the amount of energy burned. "If muscle and gait mechanics were not tightly coupled across speed, grade and load, the level of predictive accuracy we achieved is unlikely," Weyand said. The two existing equations that have been the working standards for nearly 50 years were necessarily based on just a few subjects and a limited number of data points. One standard from the American College of Sports Medicine tested only speed and uphill grades, with its first formulation being based on data from only three individuals. The other standard, commonly referred to as the Pandolf equation is used more frequently by the military and relies heavily on data from six soldiers combined with earlier experimental results. In contrast, the generalized equation from SMU was derived from what is believed to be the largest database available for human walking metabolism. The SMU study tested 32 adult subjects individually under 90 different speed-grade and load conditions on treadmills at the SMU Locomotor Performance Laboratory. "The leading standardized equations included only level and uphill inclinations," Weyand said. "We felt it was important to also provide downhill capabilities since soldiers in the field will encounter negative inclines as frequently as positive ones." Another key element of the SMU lab's Minimum Mechanics Model is the quantitative treatment of resting metabolic rate. "To obtain true resting metabolic rate, we had subjects fast for 8 to 12 hours prior to measuring their resting metabolic rates in the early morning," Ludlow said. "Once at the lab, they laid down for an hour while the researchers measured their resting metabolic rate." In separate test sessions, the subjects walked on the treadmill for dozens of trials lasting five minutes each, wearing a mouthpiece and nose clip. In the last two minutes of each trial, the researchers measured steady-state rates of oxygen uptake to determine the rate at which each subject was burning energy. Adults in one group of 20 subjects were each measured walking without a load at speeds of 0.4 meters per second, 0.7 meters per second, 1 meter per second, 1.3 meters per second and 1.6 meters per second on six different gradients: downhill grades of minus six degrees and minus three degrees; level ground; and uphill at inclines of three degrees, six degrees and nine degrees. Adults in a second group of 20 were each tested at speeds of 0.6 meters per second, 1 meter per second and 1.4 meters per second on the same six gradients, but they carried loads that were 18 percent of body weight, and 31 percent of body weight. As expected, walking metabolic rates increased in direct proportion to the increase in load, and largely in accordance with support force requirements across both speed and grade, said Weyand and Ludlow.